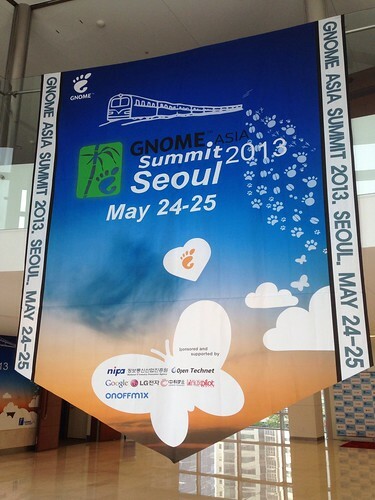 This year’s GNOME.Asia Summit took place in Seoul, Korea. 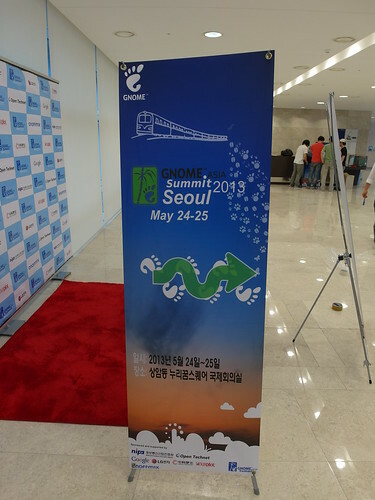 It’s my second GNOME.Asia Summit after the previous one in Hongkong and it’s again amazing to see how nice the local team put everything together. 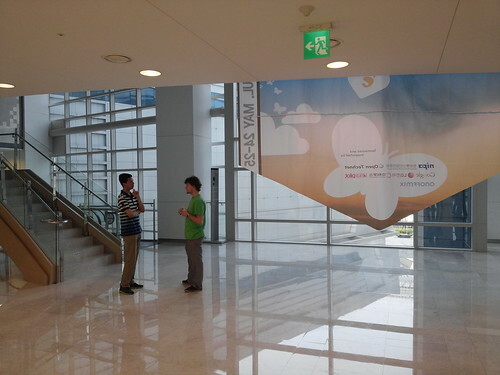 Initially I thought I’ll go to Seoul straight from LinuxTag which would have been quite stressful. Unfortunately, LinuxTag didn’t happen for GNOME We lacked people to run the booth and it’s insane to try to run the booth with only two or three people over four days. So I went more or less straight to Seoul. Via CDG. So far I didn’t like that airport because it is huge and transfers between terminals are very slow and the terminals themselves rather poor in terms of infrastructure (power, seats, WiFi, shops). But terminal 2E was surprisingly nice. It’s got designeresque chairs to sit in, lots of power sockets, free WiFi, some shops, water fountains, and it’s generally airy. So thumbs up for that. 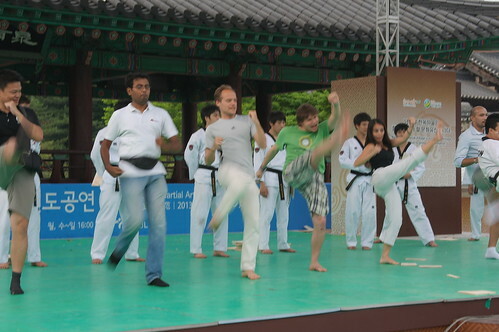 As for Seoul, things went surprisingly well. While i did organise this GNOME.Asia Summit to some extent I didn’t expect things to work out that nicely. The local team, which was pretty much unknown to me, was surprisingly big and they found a good venue and good sponsors. Lemote gave us a few laptops to give away *yay*. A raffle was organized and the best speaker got the biggest machine. I didn’t win in the raffle, but I got a machine as the best speaker. It’s a Lemote Loongson. I don’t know yet whether it is what I need. I have a very underspecced Lenovo ideapad which barely runs GNOME. Running anything that requires memory is really dreadful. Yes Firefox, looking at you. And some things like Gajim, an XMPP client, don’t even work because the machine starts to swap so heavily that every TCP connection times out. Again and again. I have to explore whether the Lemote laptop performs any better. It’s MIPS after all. And according to Wikipedia the CPU alone draws 15W. Anyway, the conference itself was good and I felt that it was bringing together people nicely. I hope that it relevant Korean businesses are happy, too. We will have to see though whether any measurable output has been generated. The reactions to my talk about GNOME 3.8 were, as already mentioned, positive. To my surprise I have to say. I was still a bit tired and jetlagged, but from talking to people afterwards I know that I inspired some folks to take a closer look at GNOME. You can find my slides here. I found a surprising large number of other talks interesting, too. Unfortunately, the aforementioned laptop died while taking notes so I can’t provided a nice summary. The most interesting thing I found was a talk about seafile. A Dropbox-like tool which sounds really good. But to be ready they have to fix some design problems like depending on a local webserver or not using established authentication and encryption protocols (think SSH). I’m happy for the GNOME.Asia. May it prosper in the future. 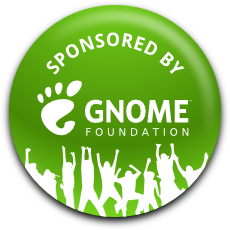 I hope we can gain some more sponsors for future editions of the event and also for GNOME. 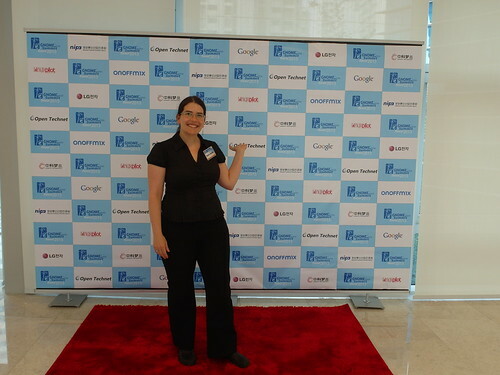 As other people already stated: I’d like to thank the GNOME Foundation for sponsoring my attendance at the conference. I’d also like to thank the conference sponsors for their support, including NIPA, Lemote, LG, Google, Linux Pilot, ONOFFMIX and Bloter.net. 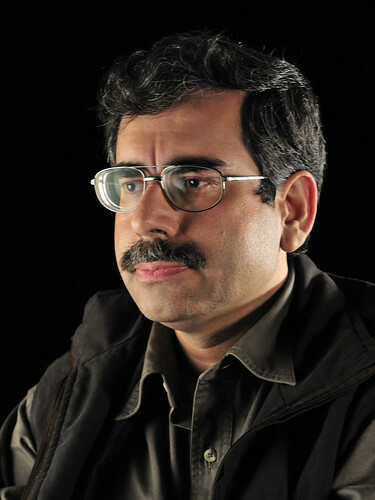 I am sad to read that Atul Chitnis passed away at the age of 51. I met him several times during FOSS.in and it was a pleasure to meet the driving force behind that conference. While certainly being a controversial figure in the Free Software world, he did a lot of good things for our communities and ecosystems. Let’s hope the FOSS.in team takes the heritage and continues to make great events for India.